Do you normally think chips when contemplating tailgate eats? I don't. But I'm not sure why. I guess my mind naturally gravitates towards mains and heartier side dishes, but in reality, there's almost always a bag or two of chips tucked into mix somewhere. So instead of making them an after thought, I decided that they were going to be the star today! 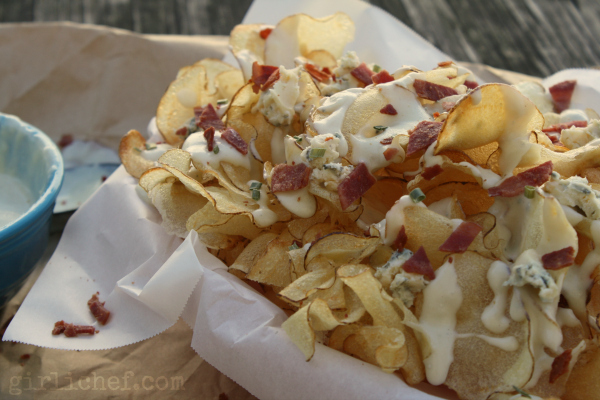 Homemade potato chips, simple as they are, can easily steal the show. That pure potato taste...the salty crunch...the endless variations that can be made to suit your tastes. Plus, you can make them in advance, let them cool, and store them in huge containers that are just ready to grab-and-go when you are. The real secret to good hand-cut potato chips, though? It's a mandoline. 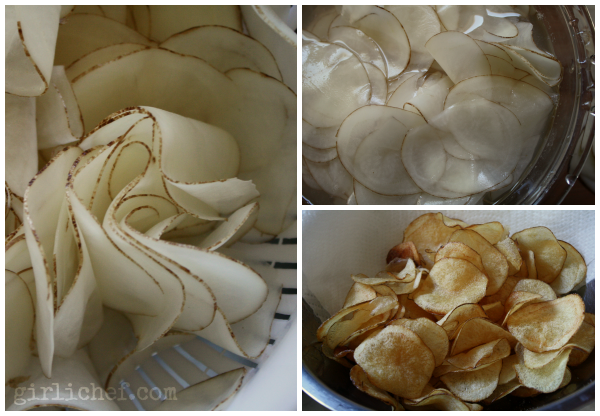 A mandoline allows for potato-after-endless-potato of beautiful, thin slices. Oh, and actually, I think that there is a second secret: ice water. Yup, before you start slicing your potatoes, have a large container of ice water on hand. Once you've finished slicing a potato, scoop the slices up and plop 'em into the ice water. Let them sit for at least 30 minutes, though I've let some sit for half a day before (obviously the ice melts, but the cold does its job). This removes all of the excess starch from the potato, plus it sort of curls them up all nice and potato chip-ey. Okay, one last secret: drying those thin slices. Pour them out into a colander and shake. Then transfer them to a sheet(s) with a few layers of paper toweling, in a single layer (yes, this part can take a while, depending on how many you're making). Pat them good and dry before frying. I lied. One more secret (that makes 4): a thermometer for you oil. Like a mandoline (no, even more so than a mandoline), a candy/oil thermometer is an absolute essential kitchen tool. There was a time when I didn't think it mattered if you had one or not....if you knew the exact temperature or not. That time is long gone. If you want to make really good fried food, get yourself a thermometer. As for the blue cheese sauce? There are 2 great way to keep it warm while you're out tailgating: a slow cooker (if you have an outlet) or a thermos (if you don't). The fun toppings take up minimal space in the cooler (think zippered baggies). 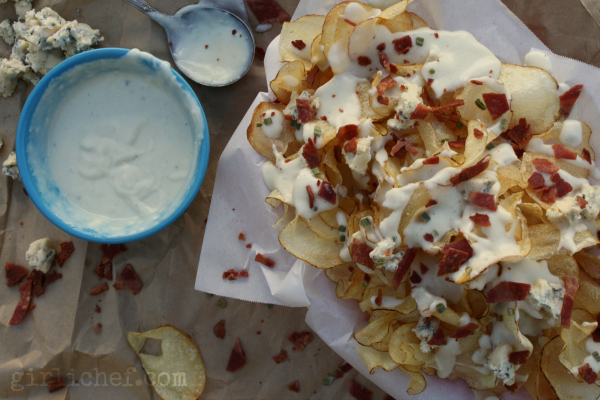 Thin and crispy homemade potato chips smothered in an addictive blue cheese sauce. Soak potato slices in cold water (or better yet, ice water) for 30 minutes; drain well; pat dry with paper towels. Pour oil into a heavy-bottomed pot, 2-inches deep. Using a thermometer to bring the oil to at least 350° F, but I find you can go safely up to 370° F. Drop in the dried potato slices into the oil until crispy, 2-3 minutes. Don't crowd the pot, do this in bunches if need be, waiting for the oil to come back up to temperature between batches. Use a metal skimmer, slotted spoon, or metal fish spatula to lift the potato chips from the hot oil onto a tray that has been lined with paper towels. lightly sprinkle with sea salt. Once completely cool, chips can be stored at room temperature up to 2 days, if covered. However, they will be best served the same day as they are made. Combine butter and flour in a small saucepan over medium-low heat, along with salt and white pepper; cook until pale, 1-2 minutes. Slowly whisk in the milk until there are no lumps. Stir constantly until mixture comes to boil, 1-2 minutes. Turn heat down as low as it will go. Whisk the blue cheese into sauce, until combined; remove from heat. If sauce seems too thick, slowly whisk in a little more milk until you have a smooth, pourable consistency. Reserve, and hold it warm. Sauce may be refrigerated for up to 2 days. Reheat over low heat, stirring (do not microwave). 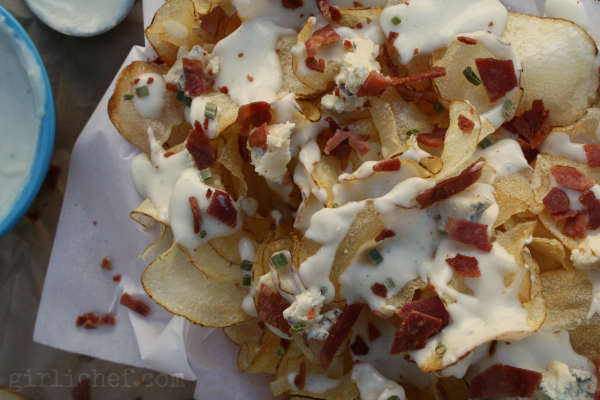 Ladle the blue cheese sauce over individual servings of chips, and then scatter some blue cheese, bacon, and chives or green onions over the top, if using. You could also serve the blue cheese sauce separately on the side for dipping. It will make the chips soggy if you don't eat it right away. Høgelund is a sweet and creamy blue cheese made in Denmark. Feel free to substitute your favorite here, if you can't find it.